Would you believe me if I told you both of the dresses I’m wearing here were under $100? Let’s chat first about this lbd! I have a number of little black dresses in my closet, but none as versatile as this one. The flexible knit fabric makes it the perfect style keep in your closet year-round. In the fall I’ll be able to throw on a a denim jacket or blazer for warmth, plus the midi length works with both heels or flats! When wearing such a simple dress I love making a statement with fun accessories. The first brand to come to my mind? Kate spade new york course! Have you heard of the make it mine collection? 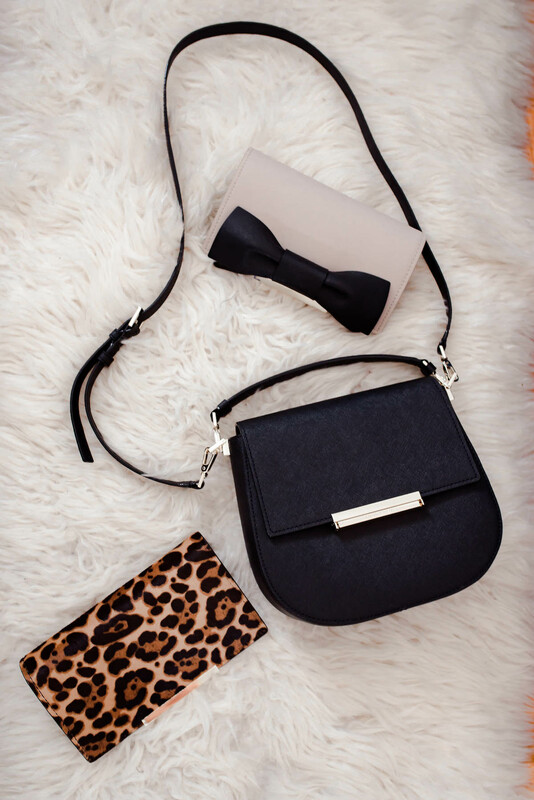 Kate spade always has the cutest bags, but with this collection you can really get creative and create your own dream purse. How? Well get this: the flap closer is interchangeable! Yep, there are a number of printed flaps like the leopard I have here that you can purchase separately and easily swap with the solid flap on your make it mine bag. I selected the round crossbody byrdie style, however there’s also a backpack, satchel and small clutch all of which have removable flaps you can personalize. Obviously I had to go for the animal print and the bow flap you’ll see below, but there are lots of pretty designs to choose from like stripes, polka dots, floral, croc-embossed leather and a gorgeous embroidered pink mosaic print. I Want. Them. All. I don’t have a huge handbag collection, so when I add a new one to the mix it’s so important to me that I’m able to use it on a regular basis. What’s great about the kate spade byrdie bag is it has a removable crossbody strap so you can wear it across the chest and over the shoulder (keep scrolling to see how I styled it this way!) Or you can take off the long strap and feel like a proper Upper East Side lady holding it by the top handle on your wrist or down at your side! It’s also the perfect size for holding the necessities: iPhone, keys, wallet, sunglasses and lipstick. A polka dot dress at a price like this? Count me in! For this look I kept all my accessories the same, except I decided to swap out the leopard flap on my byrdie bag in favor of the bow-adorned one you see here. Btw the flaps on these bags are really simple to remove. All you have to do is reach into the interior back pocket of the purse, unsnap the two snaps, line up the new snaps on your flap with the interior snaps, and voila! See how cute it is styled as a shoulder bag too? Totally one you can throw on and go, especially if you’re wearing something more casual! 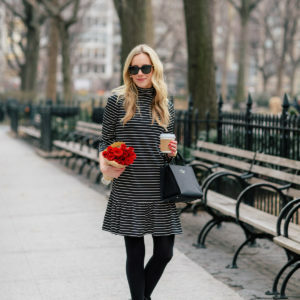 Big thank you to kate spade new york for sponsoring this post! Classy and feminine! Both outfits are flawless and suit you 100%!